More than 2,400 CMP customers were without electricity as of 9:15 p.m. 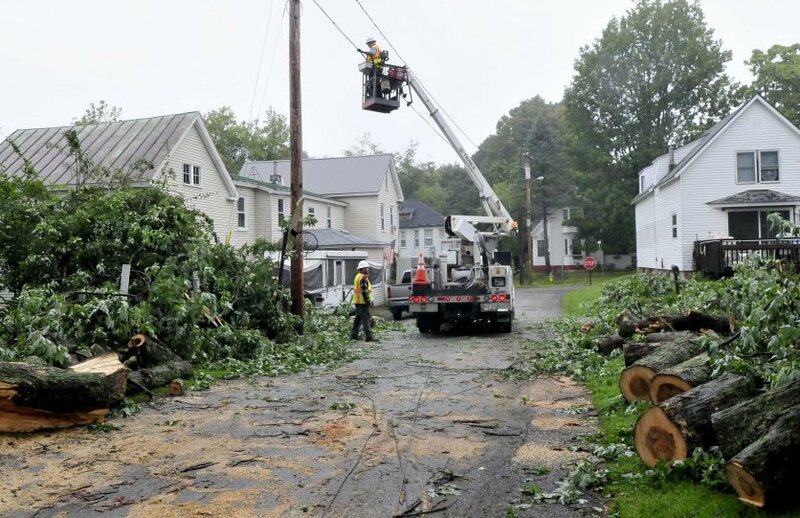 Severe thunderstorms with strong winds and heavy rain swept through western, central and northern Maine on Tuesday evening, knocking out power to hundreds of customers, toppling trees and wires into roads and forcing police to close roads. The thunderstorms began late Tuesday afternoon before moving through northern Cumberland County, Androscoggin County and Kennebec County on Tuesday night, said Bob Marine, a meteorologist with the National Weather Service in Gray. Central Maine Power Co. reported more than 2,400 outages as of 9:15 p.m., with most of them in the Oxford County towns of Hiram and Brownfield. More than 280 customers were without power Tuesday night in Bridgton. Those storms went north, with lightning strikes knocking out power to more than 2,000 Emera Maine customers in Penobscot and Hancock counties, according to spokeswoman Judy Long. She said Greater Bangor was one of the hardest hit regions. “There were some pretty good thunderstorms, heavy rain and winds,” Marine said. He said more thunderstorms could arrive late Tuesday night, with rain expected to continue through Wednesday. A dispatcher for the Cumberland County Regional Communications Center said police closed Route 113 in Baldwin, between Crawford Road and the Hiram town line, around 5:15 p.m. after a storm knocked down several trees and power lines. The road reopened around 8 p.m.
Center Road in Gray was shut down around 6:30 p.m. after a dump truck rolled over. The cause of the crash remains under investigation and no injuries were reported. In the town of Greene, motorists were being cautioned about possible delays caused by flooding at Route 202 and Sullivan Road. And in Brownfield, a large tree fell onto Denmark Road just before 6 p.m. Structure fires were reported in Newport and Anson, but it was not immediately known if those fires were caused by the thunderstorms.